Postcards from the Future are images of what our neighbourhoods will be like once governments and residents really understand the benefits of the bicycle and commit to making our streets bike and people friendly. Fortunately, through the work of CAMWEST, government, and departments, many of these images are already taking shape. Enjoy! Here in the future we have wonderful off-road cycleways that all kinds of people can use. 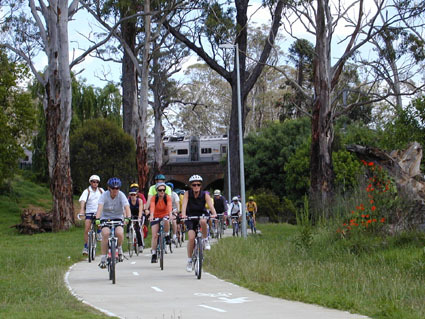 They use easily available corridors along railway lines and waterways to provide flat riding that really connects people to where they want to go. They are all well designed to Austroads standards and are also enjoyed by walkers, joggers, skaters, and wheelchair bound persons. Here in the future they use lots of contra flow cycle lanes. A one way street is changed to allow bikes to travel both ways - it make sense, and it's easy. You move the car parking lane and signage 2-3 metres, which leaves plenty of room for the bikes to move safely. They use this design a lot for Parramatta's many one way streets, which is great for small business as it creates more access. 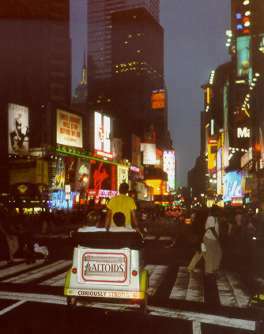 A cycle rickshaw at New York's Times Square, probably the busiest street corner in the world. Way to go! Rickshaws are very popular in many Asian countries, and are a cheap, fun and clean way to get around. We could have Power Assisted ones. In the future we have lots of great community rides, which help people see how easy bike riding is and the cycling facilities available in their area. Councils support these rides enthusiastically as they realise they encourage cycling in their area, which in turn brings many benefits to it. There are less congestion and parking hassles, less money spent on road maintenance, less noise, less road injuries and deaths, and local business gets more local clients. Avoids chicanes, so cyclists are not forced to weave in and out of traffic. 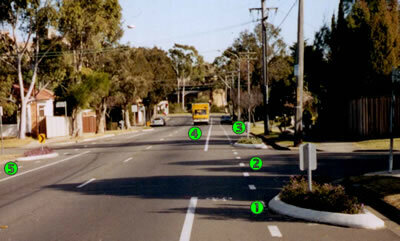 Dashed lines reminds drivers coming from a side street to look out for cyclists. Once the line is drawn, cars stick to their space. Note how the car is parked within the lines, while the truck is keeping to the traffic lane. There is clear space 'claimed' for the cyclists. The motor traffic lane is wide enough: note how the truck can easily fit. However, it's narrower so it slows traffic down. This increases safety for all: drivers, cyclists, and pedestrians. Increases area for pedestrians. A 'safety buffer' area is provided for children who may move onto the road where it's needed, between the footpath and the car traffic. This design is being implemented all over Western Sydney by councils and the RTA, as it fits easily into a standard width street, and it's very cheap (all you need is a bit of paint!). There are advantages all round. The limited traffic lane width (3.0m) reduces traffic speeds. 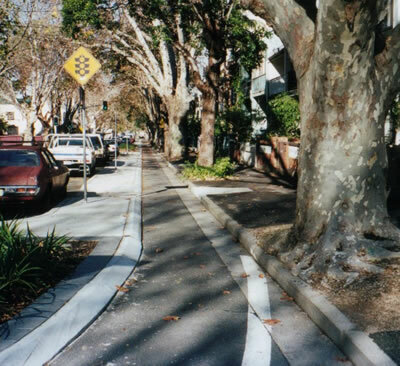 The cycle lane gives space for cyclist safety but also allows pedestrians to move out past the parked cars where they can be easily seen by motorists and limits the pedestrian zone of conflict to 6.0m. Here in the future, the design of cycleways has become an artform, with engineers putting their creative skills into action (and even laughing at the bad old days when a stenciled bicycle on a road, most often invisible under a parked car, was standard practice). Above is a wonderful example of a shared path beside a road. 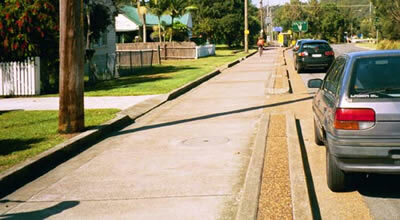 Instead of having the path right up against the fences, there's a gap so that any cars reversing out of driveways have the opportunity to see cyclists, and the cyclists can see the cars. See Also Cycle Lane Design. 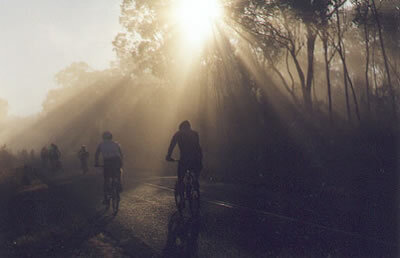 Here we are, riding in one of the many cycling tours that are organised in the future. 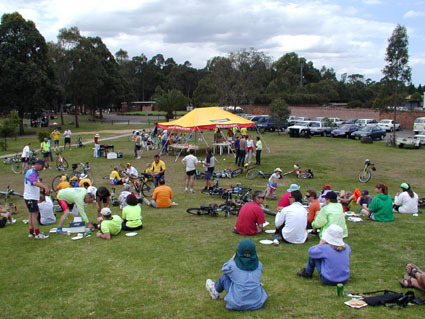 By now, Bicycle NSW's Big Ride is so popular that they do four tours per year. Many other commercial groups run tours, and thousands of tourists (including families and baby boomers) are setting out on their own. Because cycle touring is an immediate mode of transport, people come to know the little towns which would be ignored by people speeding by on the highway. It is slow, and it encourages more stops at country towns to either have a meal and a rest, enjoy the locals, or stay the night. Tours are combined with trains to cover vast areas. As a result, many understand better regional and rural Australia, and regional towns are thriving again with a welcome economic boost through tourism. 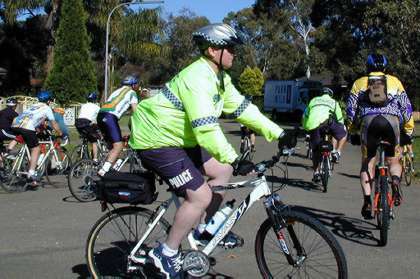 Here in the future, police have realised the power of the humble bicycle for policing. Bikes are very cost-efficient, fast, quiet, and highly visible. It brings officers closer to the community. They also use Power Assisted Bikes, so officers can respond to emergency calls quickly while not being 'out of breath' when arriving at the scene. As part of this, the government has allowed PABs of up to 300W without registration, thus allowing many Japanese and European models.